The Stags Leap District Winegrowers Association has invited us to their V2V (Vineyard to Vintner) program later this month and we are looking forward to the event. I have a particular interest in the Stags Leap District. My study of wine economics can be directly traced to a conversation with one of this area’s leading winemakers in his cellar many years ago. I’m looking forward to this focused opportunity to learn more about the Stags Leap District today and see what has changed since my last visit. The first stage of my research to prepare for the Stags Leap trip took an unexpected turn that reminded me of Warren Zevon’s song “Lawyers, Guns and Money.” Most stories of famous wine regions are about places, faces and wine. They start with places (the terroir), then move to faces (of the famous winemakers who helped establish the region’s reputation) and end with the wines themselves. Stags Leap AVA certainly has the terroir. The district, about six miles north of Napa on the Silverado Road, is marked by a 1200 foot vertical basalt palisade that is both landmark and a source of the particular soil and microclimate that helps define the district. The growing season is longer in Stags Leap than in other parts of Napa Valley, with bud break coming two weeks earlier. The grapes ripen more slowly during their longer time on the vine, which seems to have a positive effect. There is even a hallmark Stags Leap style — “perfumey fruit” according to Bruce Cass, although not every wine is made in a way that highlights this. So where do the lawyers come in? Well, the first thing I did when I started this project was to grab my copy of James Halliday’s classic Wine Atlas of California. Halliday devotes seven pages to Stags Leap places and faces and its distinctive Cabernet Sauvignon wines. But he begins his report with the most controversial part of the AVA’s history: its name and the legal battle over the the valuable intellectual property rights (IPRs) associated with it. The area takes its name from the legend of a prodigious jump that a stag (or maybe several stags) took on the palisade while fleeing hunters. Warren Winiarski naturally included this colorful reference in the name of his winery, Stag’s Leap Wine Cellars, when he founded the operation in 1972. But so did Carl Dounami, who started founded Stags’ Leap Winery just up the road, also in 1972. Two wineries, two strong personalities — they battled for years over the right to the Stag’s / Stags’ Leap name. More than an apostrophe separated them, of course, although any grammarian can tell you that where the apostrophe is placed makes all the difference. The right to label your wine with some variation of Stag’s/Stags’ Leap had obvious economic advantages and both winemakers wanted clear title to the designation. The IPR battle reemerged and intensified when the AVA was formed and its geographic lines drawn. Clashing economic interests made the process of choosing a name and drawing AVA lines particularly contentious, according to Halliday. 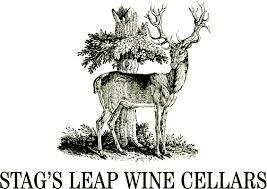 The compromise name — Stags Leap (no apostrophe anywhere, purely plural, nowhere possessive) settled the legal squabble, leaving the real task clear: making great wine. The old wine economics story of Stags Leap was about intellectual property. The new one — the one I want to explore when I visit later this month — is how the winegrowers are dealing with the current economic challenge and will respond to the future ones. The current challenge, of course, is the continuing economic crisis, which has hit some upscale producers especially hard. The future challenges? The future is hard to predict, but I’d suggest globalization (with its many threats and opportunities) and climate change, which would seem to be an especially scary prospect for a micro-region like Stags Leap. But maybe I’m missing an even bigger story? I guess I’ll have to go there and find out! Here’s Warren Zevon performing “Lawyers, Guns and Money.” Feel free to sing along, adding wine and grammar references as necessary. Enjoy! « Where Does Wine Come From?